I recently chose to subscribe to newsletters of Five (5) Nigerian companies that are actively selling one product or another for Q1 of 2016 and observed their email campaigns for about a month. I can almost bet I would rank with the highest open frequency on their mailing lists for most of the product mails delivered to my inbox. I patiently waited and surprisingly I am still waiting for some sort of action from the marketing teams; a personalized follow-up email or possibly a call, well I guess I will just keep getting the same emails with different headlines. My point exactly is this, I doubt that most business marketing teams fully understand the importance of relevant metrics, content/content format, segmentation, timing and follow-up, to delivering clear results from email marketing campaigns. The implication may give voice to the claim that email marketing is dying. 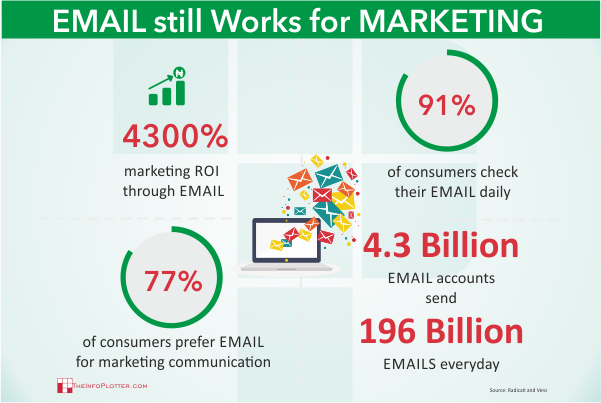 However, the fact remains; Email Marketing is alive, very well and producing great results for businesses and marketers that understand how it works. Whether your organization is into B2B or B2C marketing, the ultimate goal of marketing is to increase sales and profit and while there are various strategies and tools to help achieve this goal, email remains one of the most powerful marketing tool to build trust with customers and convert leads to customers. Email marketing has always been a numbers game. The prevailing wisdom of email marketers has been, “the more you send out, the better the chances of eliciting desired reactions and behaviors”, while the norm has been “if prospects are interested, they will respond with a call or mail to inquire further”. However, when you consider the possibility of fatiguing your audience, this numbers game changes from sending out the most emails to the biggest list possible, to increasing the odds of reaching a receptive audience. And the way to keep your subscribers open to your messages is by ensuring content relevant to recipients’ needs is delivered in the right format at the right time, while leveraging on the benefit of real-time marketing analytics to activate follow-up to move recipients further down your sales funnel. 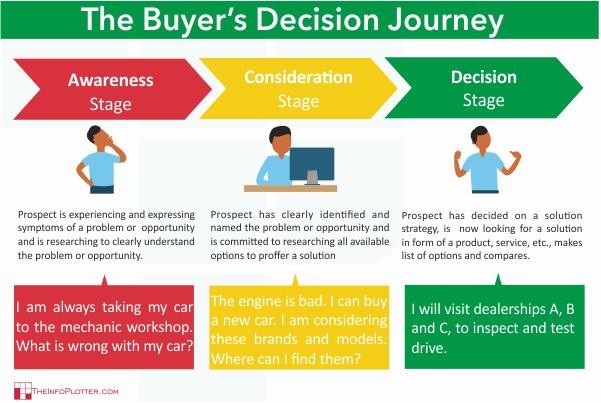 Best practice to understand your audience entails developing buyer personas (a semi-fictional model of your ideal customers) and mapping your content and content format to match where they fit in the buyer’s decision journey. This is the foundation for every successful email marketing campaign and the only way to define the right buyer personas is through insightful intelligence from original research about your subscribers. This is the basis for which you will develop your campaign strategy, content/content format and measure results. Essentially, it is mostly a combination of the following; Generating leads, Collecting feedback, Educating customers and prospects or Nurturing Existing lead. Appealing to everyone is appealing to no one. 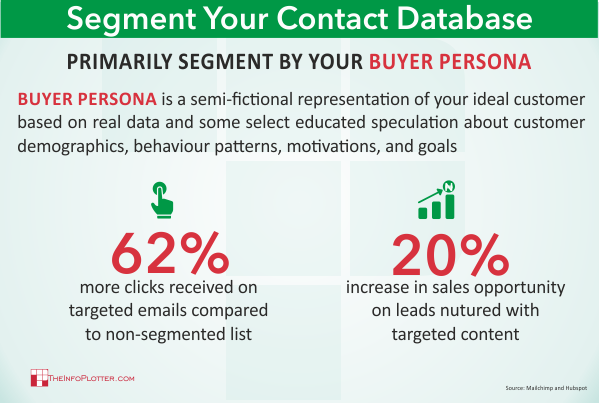 You should primarily segment your contacts by buyer persona. Fully understanding your main customers’ demographics, psycographics, role, and business problems, gives your marketing team the advantage of creating better targeted content served in the right format to engage your audience and inspire desired action. 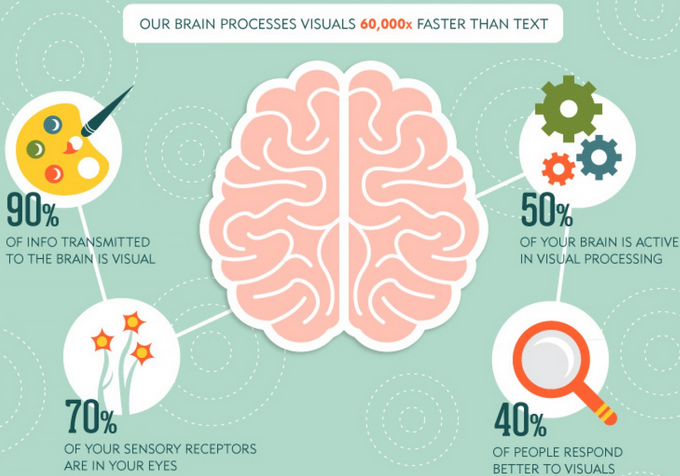 Visual communication is the name of the game at this stage. Less is always more: your personas are probably just as busy as you are—make it easy for them to consume your content using the power of visual content on responsive email templates. Remember to match the content and content format to the stage your audience fits on the conversion journey. The right information, delivered at the right moment, creates a distinct competitive advantage. Not only can it transform a vague desire into a sale, it can also build loyalty. Conversely, when the timing isn’t right, even the most relevant content may prove worthless. Monitor metrics such as Bounce Rate, Delivery Rate, Open Rate, Click through Rates, List Growth Rate, Sharing/Forwarding Rate, Conversion Rates, and Unsubscribe rate. Tracking click-through rates and conversion rates is the best way to monitor subscriber engagement, interest and ultimate measurement of your email marketing campaign success. If you’re going to stay relevant, it’s not enough to tout the benefits of your product/services; you need to sell an entire experience. Your customers expect more than information; they expect personality. Providing value to your email audience entails meaningful human interactions. Look at the right metric such as open rate, open frequency per contact, click rates/frequency etc. to measure your audience interest and follow-up immediately with a more personalized email or a telephone call. A great tool to track opens for personalized emails through Gmail and Outlook is SIDEKICK. You should check it out. 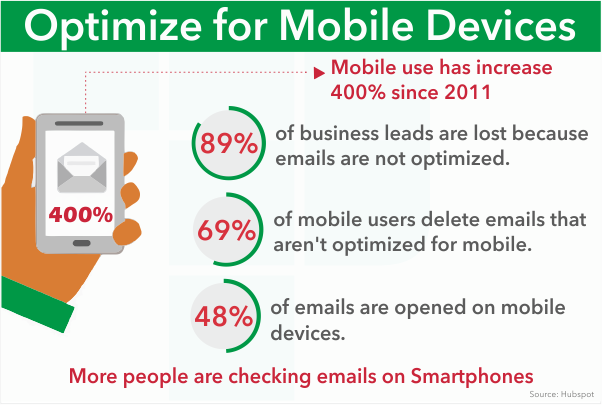 If you’re not optimizing your emails for mobile, you’re losing a significant amount of opportunities. See the statistic below. Creating your own responsive template may be beyond your particular skill set, thankfully can use some responsive template provided by email management platform. However, to stand out from the crowd, you can consider engaging skilled professionals. To grow email database, marketers sometimes purchase lists. This practice is counter productive: it might add invalid addresses to your list and thus pollute your entire database. And even if the addresses you acquired are valid, the new recipients will most likely not be interested in your content and either unsubscribe or not engage with your emails altogether. Earn your subscribers. How? 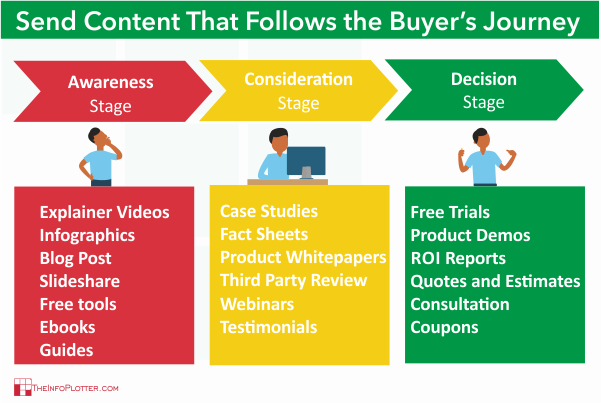 Consistently offer relevant content in a visually stimulating and engaging way. Make it clear to your target market what they will get out of subscribing to your emails and deliver on your promise. E-book will be delivered directly to your email.